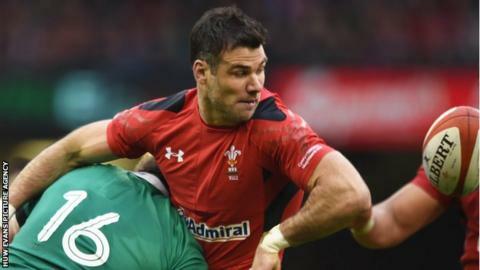 Wales scrum-half Mike Phillips knows he must excel in Saturday's World Cup warm-up match against Ireland to keep his place in the squad. Head coach Warren Gatland will reduce his 47-man squad to between 36 and 38 players after the game in Cardiff. With Rhys Webb the first-choice scrum-half, 32-year-old Phillips faces a fight to reclaim his starting berth. "I'm sure some players are nailed-on. I'm probably one of those that has to impress in these games," he said. "Any opportunity you get on the field, you've got to impress and that's what these games are all about." The British and Irish Lions Test player has made 93 appearances for Wales, winning two Grand Slams and a Six Nations title. But he has been restricted to a place on the bench recently, usurped by former Ospreys team-mate Webb. He also faces competition from Scarlets scrum-half Gareth Davies and Lloyd Williams of Cardiff Blues for a place in Wales' 31-man World Cup squad. Phillips, who plays for French club Racing Metro, made his most recent start for Wales against Fiji in November 2014. Gatland's squad have prepared for the World Cup with training camps in Switzerland and Qatar. Phillips says they were even more gruelling than those they undertook in Poland four years ago. "It was brutal. Every day was intense," he said. "As I'm getting older, they're getting harder. This is the toughest yet." After Saturday's opening warm-up match against Ireland, Wales face the Irish in Dublin on 29 August before hosting Italy at the Millennium Stadium on 5 September. On 31 August, Gatland will trim his squad to a final 31 for the World Cup. Backs: Gareth Davies (Scarlets), Mike Phillips (Racing Metro), Rhys Webb (Ospreys), Lloyd Williams (Cardiff Blues), Gareth Anscombe (Cardiff Blues), Dan Biggar (Ospreys), James Hook (Gloucester Rugby), Matthew Morgan (Bristol Rugby), Rhys Patchell (Cardiff Blues), Rhys Priestland (Scarlets), Cory Allen (Cardiff Blues), Jack Dixon (Newport Gwent Dragons), Tyler Morgan (Newport Gwent Dragons), Jamie Roberts (Racing Metro), Scott Williams (Scarlets), Hallam Amos (Newport Gwent Dragons), Alex Cuthbert (Cardiff Blues), Leigh Halfpenny (Toulon), Tom James (Exeter Chiefs), George North (Northampton Saints), Eli Walker (Ospreys), Liam Williams (Scarlets). Forwards: Rob Evans (Scarlets), Tomas Francis (Exeter Chiefs), Paul James (Bath Rugby), Aaron Jarvis (Ospreys), Gethin Jenkins (Cardiff Blues), Rhodri Jones (Scarlets), Samson Lee (Scarlets), Nicky Smith (Ospreys), Scott Baldwin (Ospreys), Kristian Dacey (Cardiff Blues), Richard Hibbard (Gloucester Rugby), Ken Owens (Scarlets), Jake Ball (Scarlets), Luke Charteris (Racing Metro), Dominic Day (Bath Rugby), Bradley Davies (Wasps), Alun Wyn Jones (Ospreys), Rory Thornton (Ospreys), Dan Baker (Ospreys), Taulupe Faletau (Newport Gwent Dragons), James King (Ospreys), Dan Lydiate (Ospreys), Ross Moriarty (Gloucester Rugby), Justin Tipuric (Ospreys), Sam Warburton (Cardiff Blues, capt).